The grand opening of the store was very successful. The store experienced an increase of 40% in sales since opening. Robert Lowe Jr. had accomplished his dream. Lowe’s Market in Alamogordo, New Mexico has been a historical treasure for over fifty years. Overtime, the history of this quaint military base town was captured on film and the precious photos were printed and placed throughout the grocery store. Pamphlets were made with numbers correlating to each large photo mural. Customers could meander through the store and find their ancestors or take a walk down memory lane. 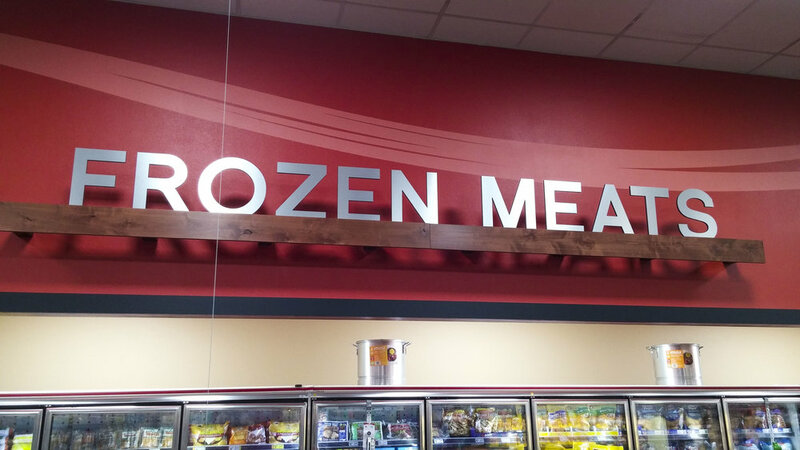 In 2015, Roger Lowe Jr. realized that his store desperately needed an update. He wanted to make this store his first “Signature Lowe’s Marketplace”, which would allow him to bring the Alamogordo community the best Lowe’s had to offer. When loyal customers found out the store would be remodeled, they were outraged. Roger Lowe Jr. knew the importance of these photographic treasures, which is why he hired the Decorworx team to not only bring new life to his store, but to preserve these much loved photos. The final design chosen for this store created an upscale mood, interwoven with tradition and nostalgia. Every cherished photo was touched up, given dimension and mounted on cherry stained wood. Each of the photos was purposefully placed throughout the entire store design. At the grand opening of the updated store, guests searched for their favorite photos and were thrilled by the experience that Lowe’s Market worked hard to achieve. The design priority for the store was to fit the décor to the new “Signature” brand. 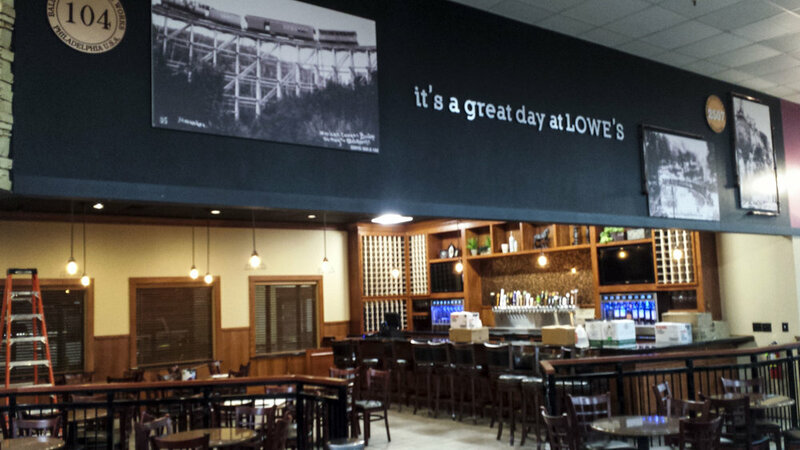 This is the first Lowe’s Market to reach out to customers with a comfortable, yet upscale atmosphere. A new logo and weekly ad were created for the store. Extensive meetings were held to discuss the store’s layout, which was arranged in such a way that guests would feel a warm welcome as they entered, yet they received a “wow” feeling from the updated decor. Alongside the “wow” design, specialty products and programs were soon to be a part of the new and improved Lowe’s Signature Marketplace. Warm jewel tones and stone accents helped maintain a classy, yet comfortable feeling. Soft, curving lines provided the design with an organic feeling to appeal to a younger demographic. Delicate, custom lighting contributed an artistic appearance to the overall feeling of the store. An exquisite wine department, highlighted with custom cherry wood shelving and home décor, sets the updated store apart from the competition. Along with an impressive selection of wine, liquor and beer, customers are now able to enjoy their favorite products at the bar or at the plush seating area complete with a fireplace and large screen TV. The Tortillaria, which provides the best selection of homemade tortillas in Alamogordo, was given special attention and customers are now able to watch the fresh tortillas be made before their eyes. 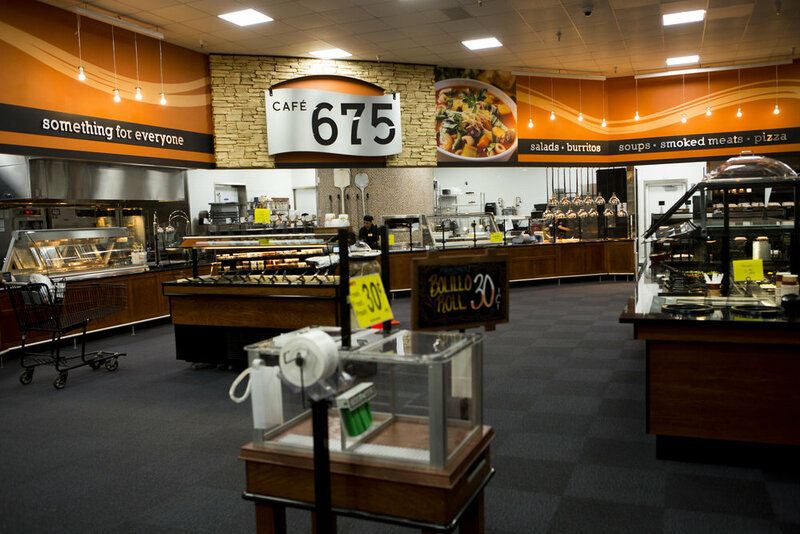 Other specialty store features include the custom burrito bar, mosaic pizza oven and market fresh bakery and deli.